The car is like new, see the photos. 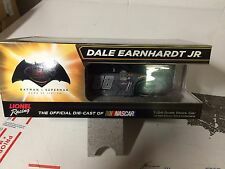 Up for sale is a special Dale Jr diecast, it is the number 88 HMS 2016 Batman vs Superman Action 1/24 scale. This diecast is new, never displayed. 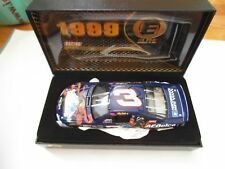 UP FOR SALE IS A MIB DALE EARNHARDT JR ACDELCO / SUPERMAN 1999 MONTE CARLO ELITE. I BOUGHT A COLLECTION OF ELITES FROM A GENTLEMAN THEY HAVE TO BE ONE OF THE BEST LOOKING COLLECTIONS I HAVE SEEN THE CAR IS IN GREAT SHAPE AND IS A GREAT PIECE FOR ANY COLLECTION THE BOX HAS MINOR WEAR. Dale Earnhardt Jr super man racing. This car was set up on display and was never handled just was for show. 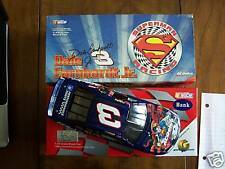 Dale Earnhardt Jr. Action RCCA ELITE 1999 #3 Superman ACDelco Monte Carlo 1:24. SUPERMAN in his first trip. New in Box. 1999 Monte Carlo. This is a great looking car with clear window and doubles as a bank. This is only 1 of a limited edition ever produced. This is a dale Earnhardt jr. # 3 1999 monte Carlo. ACTION RACING . it is new in the box. box is in like new condition, this is a original car from 1999 not a redo this is a buy now price. SUPERMAN in his first trip with jr.. This buy it now item consists of a 2014 Dale Earnhardt Jr. #88 National Guard Superman 1/24th. diecast car. 5,317 of these 2014 Impala cars were made. A beautiful car for your collection.This is in mint condition(new). DALE EARNHARDT JR. AC DELCO, SUPERMAN, BANK. Dale Earnhardt Jr #3 AC Delco Winners Circle 1998 Monte Carlo 1:24 . Condition is New. Shipped with USPS Priority Mail. 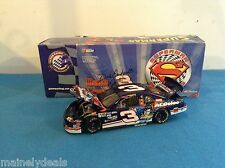 1999 DALE EARNHARDT SUPERMAN ACDELCO MONTE CARLO 1:24 CAR PLUS 1:64 Car With COA NEW IN BOX. NEW IN THE ORIGINAL BOX, HAS NEVER BEEN DISPLAYED. INVENTORY BOX CAR 9. - APPROX SIZE OF CAR: 8" LENGTH. - APPROX SIZE OF CASE: BOTTOM 9 3/4" LENGTH X 4" TALL X BOTTOM 5" DEPTH. BOX IS IN GOOD CONDITION. (This is for your protection and ours. Lithograph and Statue - FLAT item and Large Item). There is no need to request one we do it automatically. Do you have any more pictures available you can send?. GET THE SUPER HERO THAT WAS FASTER THAN A SPEEDING BULLET. ABLE TO LEAP TALL BUILDINGS..... MINT CONDITION. 1/24 2014 Action #88 National Guard / Superman / Hendrick Motorsports Chevy SS as driven by Dale Earnhardt JR. The paint and finish on these cars is amazing and my amateur photos don't do it justice. 1999 Monte Carlo. This is a great looking car with clear window and opening hood / trunk and vents. This is only 1 of 4,008 ever produced. Clear Window bank. Box has limited shelf wear. Your Buying- A 1/24 Action Brookfield Dale Earnhardt #3 Superman Car,Truck & Enclosed Trailer set. Bought this in a collection with many other cars we already had one in our collection. I also attend sales and pick up things here and there and list them just a Nana keeping busy. Look closely at the picture, what you see is what you get. Great condition. I AM LIQUIDATING A HUGE NASCAR COLLECTION. Da le Earnhardt Jr #3 AC Delco. 1998 Chevrolet Monte Carlo. 1:24 scale die cast replica. HAS NEVER BEEN ON DISPLAY. ONLY TAKEN OUT OF THE BOX TO PHOTOGRAPH. WOULD MAKE A GREAT ADDITION TO ANY COLLECTION. •Brookfield Collectors Guild. •Dale Earnhardt Jr. This is a piece from a fan's collection that is being sold due to relocation. This is Limited Edition with authenticity papers. •Limited Edition of 4,224. Here is another great Die Cast Car from DLW Wholesale. Pictures are of t he Die cast car you will receive. Used; Out of box. GREAT DALE JR. CAR AS DESCRIBED AND PICTURED ABOVE. TAKEN OUT FOR PICTURES ONLY. 1999 Dale Earnhardt Jr AC Delco Superman 1/24 Chevy Monte Carlo by Revell. #108 of 350 made and has a numbered plaque in the rear window. This Dale Earnhardt Jr Car is in great condition and is a must have for any NASCAR and Dale Jr fan! a throwback to when he was just starting out on the NASCAR Circuit! AC Delco, 1999, Monte Carlo, Elite, RCCA, Action, NASCAR. Dale Earnhardt Jr., #3, Superman. PRE-OWNED STILL IN BOX SEE PHOTOS. May have scratches, dings, shelf wear. 1/24 2014 Action #88 National Guard / Superman / Hendrick Motorsports Chevy SS as driven by Dale Earnhardt JR. Limited Numbered Edition 1 of 216 made worldwide! Rare and Beautiful Liquid Color finish. Overall nice condition. In original box and sleeve. 1999 Monte Carlo 1:24 scale. Dale Earnhardt jr #3 ACDelco limited edition. Please view pictures. This diecast was issued by Revell. This is a Dale Earnhardt Jr. #88 AMP Energy/National Guard Flashcoat Silver Chevrolet Impala 2010 1/24 Die-cast Cup Car. This Action die-cast car is new in box and is numbered to 1,274 pieces. Do not pass up the opportunity to own this beautiful diecast car. In great used condition, without original box!